like smoke, a bushman agbada. No animal wears that skin. Yr sax blurts & farts & screeches truth. Phat & fresh green smoking truth. No animals in yr skin. because the spirits told you so. never tire of baiting with yr words. Yab dem Fela yab dem! Never sell out! Never a saint! What use to people a man without sin? Nigerian-Mancunian Segun is a singer, poet, producer/composer, playwright, film-maker & club promoter, founder member of Manchester’s Speakeasy People poetry collective. As singer for cult triphop band, Earthling, Segun has performed on MTV, BBC1, VH1 & Canal 5. 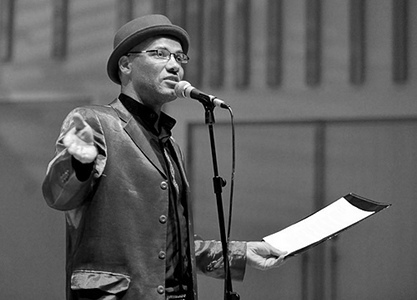 As a poet and playwright, Segun’s work has been commissioned for broadcast on BBC Radio 3 and RadioManchester. Segun’s debut solo show, Bro 9 at Contact Theatre, won Best Fringe Performer & Best Design in the prestigious Manchester Evening News Theatre Awards. In autumn 2005, Segun was nominated for the Arts Foundation Performance Poetry award. Segun’s first poetry collection, Praise Songs for Aliens was published by Suitcase Press in October 2009.